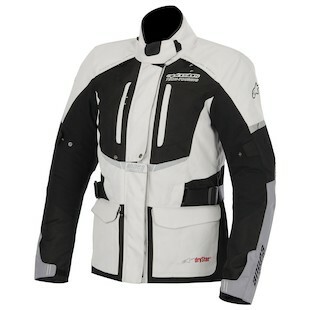 Earlier this year, Alpinestars dropped a bomb on us in the form of the Stella New Land Gore-tex jacket and pants. The New Land is almost twelve hundred dollars worth of fine materials and protection. But, that’s a lot of money! Many of us have eyed this set longingly. But with all of our other expenses considered, not all of us were able to commit to these fine pieces of moto-gear. 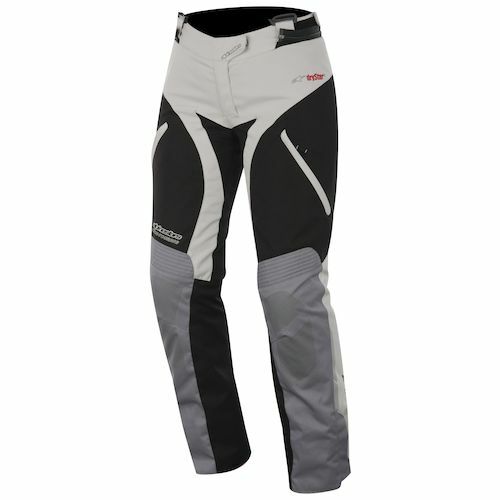 With that in mind, Alpinestars is now offering the new Stella Andes Drystar Jacket and Pants. The result is 3-season cold-weather, highly technical touring gear at price that doesn’t make most of us wince. Thank you, moto-gods! Now let’s get down to it. Obviously this alternative is awesome for the aforementioned reasons. But, there are lots of other reasons to be excited as well. Alpinestars is opening up their Women’s line and doing new, wonderful things! We’ve seen them offer up a few other sport-inspired, technical pieces for women in the past but the Stella Andes really caters towards the rider whose main riding focus is touring and/or commuting. Like its New Land big sister, the Alpinestars Stella Andes Jacket is going to be all waterproof, all the time via its floating Drystar liner. Now, you must be wondering how the two differ. Well simply put, Gore-tex is the top dog in the ring of waterproofing and breathability. Does that mean that your Drystar lining will leave you feeling like you’re trapped in a plastic trash bag? Absolutely not. Drystar, like many other waterproofing technologies, is designed to mimic Gore-tex in this respect. So, you may notice a difference between the two and you may not. But let’s be honest, you will notice a difference in that price tag. Moving from waterproofing to warmth, the Alpinestars Stella Andes Pants and Jacket will also include a full sleeve liner for winter riding that can also be removed during the Fall or Spring. That said, we don’t suggest pushing this jacket too far into warmer weather. The zippered intake vents on the shoulders and legs coupled with the exhaust vents at your back will only cool you down a little bit. For hot weather, we’re thinking that a mesh jacket will be more your cup of tea. Now, the big kahuna - protection. Alpinestars may have blown your mind with their use of teflon coating on the exterior of the Stella New Land series, but they certainly don’t disappoint with the Andes either. The construction of this jacket is going to consist of a PU coated 600D chassis with 1000D for extra abrasion resistance in the impact areas. And because your lower arms and knees can take the brunt of a spill, Alpinestars has also coated those areas with TPU panels for good measure. Oh, and there’s more. The Andes also incorporates lots of reflective details and logos to keep you visible as well as CE certified elbow and shoulder impact protectors to keep your bones intact. We think this goes without saying, but upgrade your protection people! Additional creature comforts like adjustability, aramid stretch panels and pockets galore are included but come as an afterthought with all of these other functions in mind. All in all, the Stella Andes is no compromise in our eyes. She may be the little sister to the New Land, but she’s a fiery little pepper of a sister indeed.